THAT’S RIGHT! CHECK OUT OUR TWO-WEEK SPECIAL FOR ONLY $49.00! Come in for this introductory offer! Call the studio at (714) 641-1745 to take advantage of our two week special! Each week you will receive one private lesson and up to three group lessons per week! 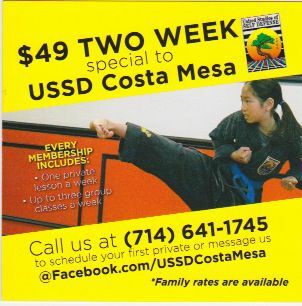 Get your martial arts training started TODAY! We offer classes for children, teenagers and adults. We can tailor your private lessons to fit your schedule, physical abilities, and goals! Call at (714) 641-1745 or email us.